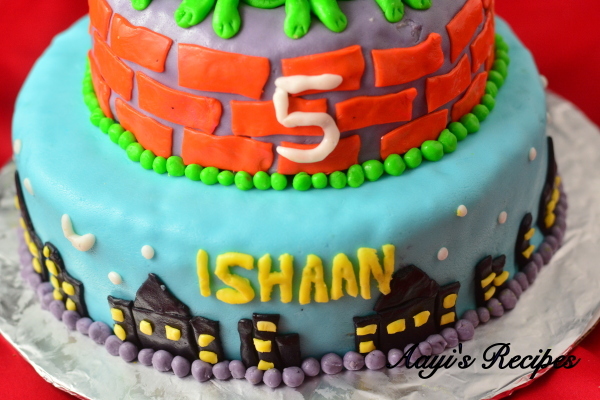 Ishaan is turning 5 soon. 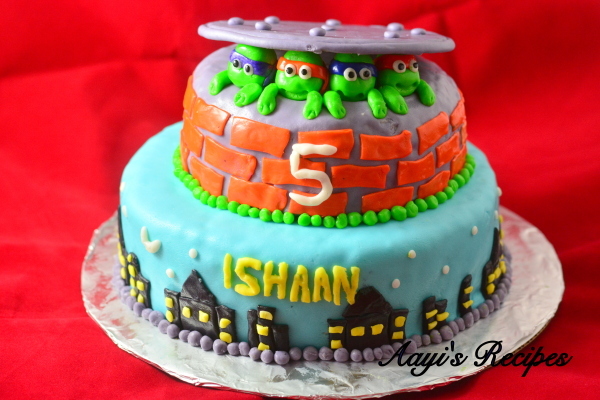 After the spiderman craze, he moved on to Ninja Turtles sometime last year. He heard about them from his friends at school. He would come home and ask more about them and I had no clue. Then I got him a book about these mutant turtles. No looking back ever since then. He wanted ninja turtle shoes, hat, cloths etc. He knew the names of all the ninja turtles and even made up stories about them. His play time with his friends involved him becoming Leo – the leader!. When I asked him about the cake, he didn’t think much. 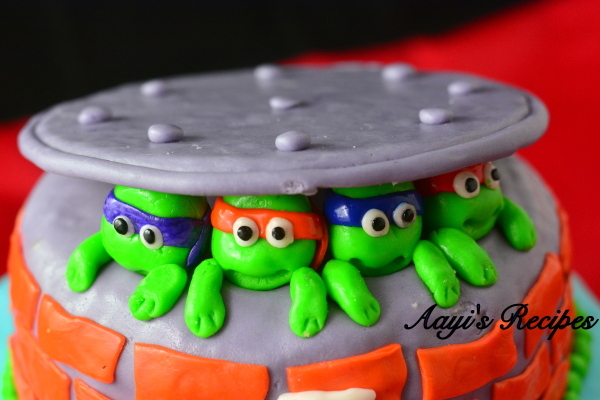 He wanted a ninja turtle cake. He is moving on to a new school from August. So he wanted to invite his friends and teachers from the school for his birthday party. We decided to have a Gymnastics party for him – he loves jumping around the trampoline and running around the place. It was such a big hit. Both Ishaan and Ayaan had so much fun. Here is the cake I baked and decorated for him. It was cookies and cream cake with fondant decorations. 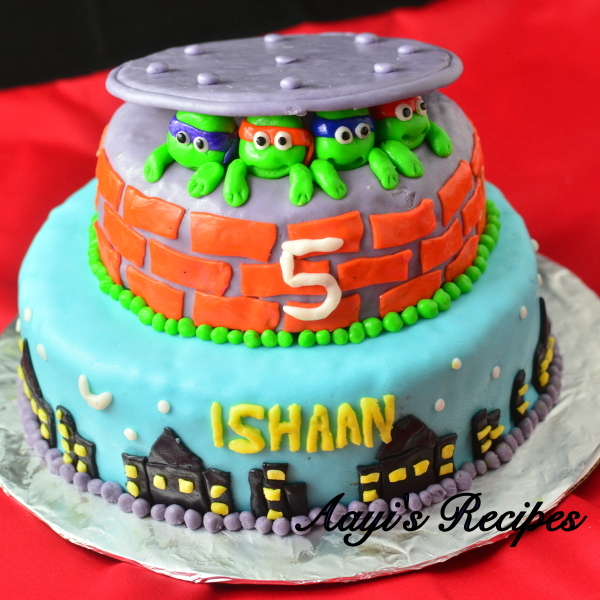 I usually stay away from fondant but I read this post from Veena – she has become my online guru. I have learned so much from her videos and posts. I tried the fondant and it was the best tasting fondant I have ever used. I am going to use fondant more frequently from now on. The cake was a huge hit – both lookwise and tastewise. I followed this tutorial to decorate the cake. I have never attempted a fondant cake. Today is my husband’s birthday….and I made backforest cake. I wanted to make some theme cake like this. Now your post has inspired me to try one. Thank you! 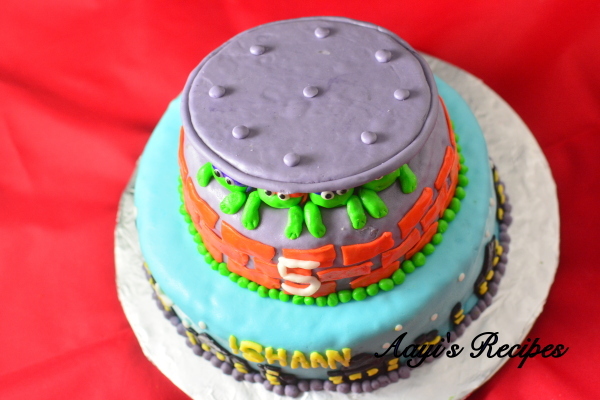 Many Many Happy returns of the Day To Dear Ishaan, God Bless You Dear. Hi, how do you manage to do the icing so flawless, that is no lines at all on the circular cakes? Any tips please?